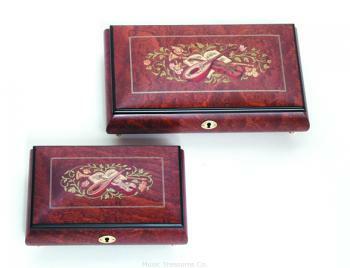 PORTER MUSIC BOX This box is encased in fine inlaid wood handcrafted in Italy, featuring a Sankyo engineered tunes of precision 18-note movements. You can choose from one of the song titles listed and your assembled box will be shipped directly from the Porter Music Factory in Vermont. 10.625" wide x 6" deep x 2.75" high Select your tune from the list. Box is special order and will be drop shipped. Allow two weeks for delivery.